Deadliest Warrior - Episode 1 - "Spartan vs. Ninja"
The Pacquiao vs Hatton 24/7 episode 3 on HBO began at Joy's home with Kool Aid being dished out by Mayweather for Hatton's entourage. Mayweather is a pretty good artist, as he showed his Ali and Elvis paintings, as well as his quirky fashion sense. Pacquiao, once again, floors a sparring partner with a shot to the body. His opponent was paralyzed and was wincing in pain and tears. Pacquiao gestured to help, but his sparring partner stays on the ground because of the pain. Roach acknowledges that he allowed preparations to be televised because these might be a psyche deterrent for Pacquiao's opponents. Roger Mayweather, the brother of Floyd Sr., offers one of their fighters support for the preparation. Roger then said that Hatton had better win and beat the shorter Pacquiao and if not then you should give all his boxing gear so that he can start a fire. Pacquiao mother arrives, she was never in the U.S. before and had never watch the fight of her son live. Pacquiao leaves, while her mother go shopping at Rodeo Drive. Pacquiao flew towards San Francisco to launch the opening of baseball team San Francisco Giants. It was a 'Filipino American Heritage Day, as hordes of sports fans are at that place to embolden him on. The presenter told the crowd Manny Pacquiao is the best fighter pounds for pound worldwide around the park as AT&T goes wild. All persons involved in this game of baseball gets a Bobble Head of Manny Pacquiao. Deadliest Warrior - Episode 2 - "Viking vs. Samurai"
Deadliest Warrior - Episode 1 - "Gladiator vs. Apache"
TUF Season 9 Episode 4 - The members of Team US and Team UK are now complete. Who will get the first victory in the first US vs UK fight of the show? Thiago Alves has Wanderlei Silva as a hero and idol and will be coming to Las Vegas before his fight against GSP-George St. Pierre to train at the Wand Fight Team. UFC 97 Redemption Prelim MMA fight video of Ed Herman vs. David Loiseau. This Ultimate Fighting Championship bout took place on April 18, 2009 in Montreal, Canada at the Bell Centre (Le Centre Bell). UFC 97 Redemption Prelim MMA fight video of Jason MacDonald vs. Nate Quarry. This Ultimate Fighting Championship bout took place on April 18, 2009 in Montreal, Canada at the Bell Centre (Le Centre Bell). In this Episode 2 of Pacquiao vs Hatton on HBO, we learn that Pacquiao trainer Freddie Roach had modest roots and continues to believe a Wild Card aura ought be a "real" flight from the false Hollywood scene around him. Roach tells the incredible story of how when he's a telemarketer, actor Mickey Rourke called him that led to their training together. Rourke, eventually gave Roach the now the known Wild Card boxing gym where trained several notable title-holders. Actor Mark Walberg said that everyone have the same level in Wild Card gym, with the exception of Pacquiao. He was this time seated next to Batman actor Christian Bale. The gym is now much more stringent to prevent all of the fans of distractions. Roach even said that he will have his own mother thrown out if he deemed her distracting. Pacquiao keeps battering his sparring partner, on this occasion, an opponent of land with a brutal body blow. Also included in the Hatton vs Pacquiao 24/7 is Hatton's family - His brother who will be an undercard. Hatton's mother tells that Ricky, just like his father, prefers tall women. Her fiance Jennifer, is 5'10 ," and his son is also included. Floyd Mayweather Sr. has a great commute 20 minutes each morning where he meets Ricky Hatton. He reminds the audience of what could have been, had his career been stopped prematurely due to a gunfire. He expressed that if given a chance he would someday restrengthen his kinship with his estranged son. Somewhat sad video of Chuck Liddell going backstage after his loss to Shogun Rua. UFC Middleweight Champion 'Anderson "The Spider" Silva' fights #1 Contender 'Thales Leites' at the 'UFC 97: Redemption' Event. Bout held April 18th, 2009 at the Bell Centre, Montreal Canada. Canadian Denis Kang of American Top Team fights Xavier Foupa-Pokam @ UFC 97 Redemption in the Bell Centre in Montreal, Canada. Sam “Hands of Steel” Stout faces Matt Wiman @ UFC 97 Redemption in the Bell Centre in Montreal, Canada. Anderson 'The Spider' Silva went through a long workout and then spoke with the media. He was all business about his fight with Thales Leites. 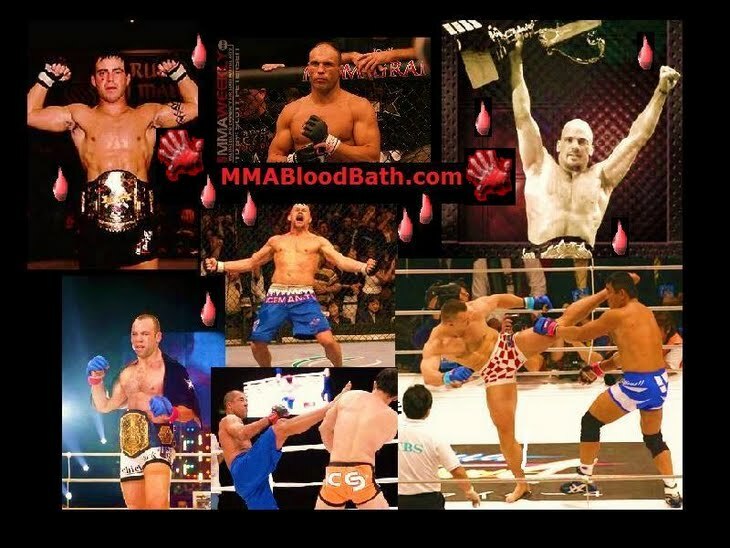 Joe talks about the Liddell vs Rua matchup at UFC 97 with MMA ring Report. This HBO Sports series counts down to the highly anticipated May 2 pay-per-view bout between Ricky Hatton (45-1-0, 32 KOs) and Manny Pacquiao (47-3-2, 35 KOs). In this episode Manny Pacquiao vs Ricky Hatton 24/7 Episode 1 HBO, cameras follow both camps as Hatton and Pacquiao trains for the upcoming fight. 'Frank Shamrock vs. Nick Diaz' at "Strikeforce: Shamrock vs Diaz - Event" by Showtime on PPV, Saturday, April 11th-2009. 'Benji Radach vs. Scott Smith' at "Strikeforce: Shamrock vs Diaz - Event"
'Rodrigo Damm vs. Gilbert Melendez' at "Strikeforce: Shamrock vs Diaz - Event"
'Brett Rogers vs. Abongo Ron Humphrey' at "Strikeforce: Shamrock vs Diaz - Event"
Trash Talk with Shamrock and Diaz.